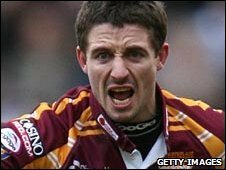 Former England international Chris Thorman has joined Championship One club York City Knights as a player-assistant coach. The 29-year-old half-back, who left Hull recently, is thought to have turned down offers from Super League clubs to join York on a two-year deal. General manager Ian Wilson told BBC Radio York: "It's a massive signing. "He's got that experience of playing at the highest level for the last 10 years in Super League." Thorman's Super League career has taken him to London Broncos, Huddersfield Giants and last season, Hull FC. Wilson said: "Added to that he's had a year playing in Australia in their first grade for Paramatta. "There's not many British players in the last 10 years been able to do that so that shows what a quality player he is. "He'll add a lot of experience to what predominantly is a young side at York next year so it's going to be vital. "By his own admissions he could have stayed in Super League which we were fully aware of but I think the lure of getting into coaching was something that swayed him. "He's got to think about finishing his career when he finishes playing. I've no doubt he'll make a quality coach." Thorman will work alongside current assistant coach Mick Ramsden and head coach James Ratcliffe. Wilson said the deal will be formally completed over the weekend.